An advantage that I have coming of age in the 2000s is that I have no reference or anchoring point to the “good old days” when savers could get real returns just by holding money in a savings account at their local bank or agreeing to store some funds in a certificate of deposit. I think I once stumbled across an old Kiplinger’s magazine from the early 1990s that talked about how $100,000 in a savings account paying 5% could be reliably counted upon to generate over $400 per month in retirement income. If you saved a chunk of capital during the 1960s, 1970s, 1980s, or 1990s, socking it away in a certificate of deposit was often a credible alternative to stock-market investing. What you gave up in gains you made up for with the risk-free nature of your returns. 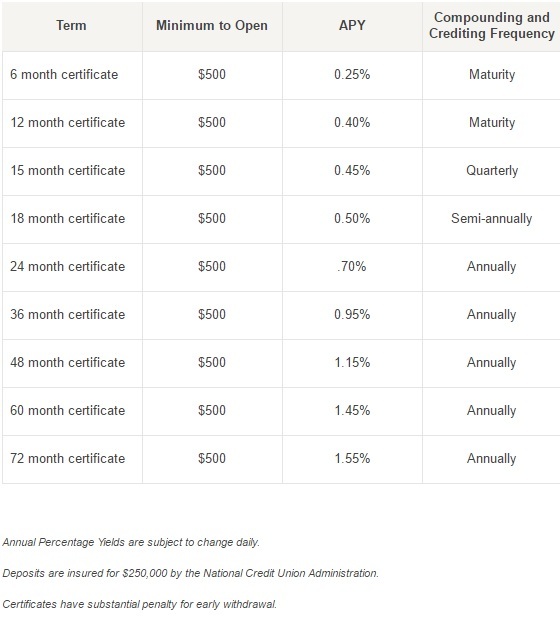 I was looking at the CD offerings of my local bank recently, and I couldn’t help but wonder: Who are these people locking their money away at rates lower than inflation? The terms are terrible. Not only is the maximum rate 1.55%, but the compounding only occurs annually (rather than monthly or quarterly) and there is a penalty of six months’ interest forfeiture if you sell your CD before the term fully expires. I have said it before, but it bears repeating: Just because a financial product exists does not mean that it falls within the realm of intelligent investor. Some products should have no markets, and 72 month CDs bearing 1.55% interest is one of them. Who knows how many people take up that offer, but let’s perform a quick calculation of the payoff for owning this CD for six years. With compounding that only occurs annually, a $10,000 CD paying 1.55% will only give you a total value of $10,973 at the end of six years. If you assume that inflation over the next six years is equal to the 3.5% inflation rate that existed from 1960 through 2015, then that $10,973 will only have the purchasing power equivalent to what we today understand as $8,891. The practical effect is that you won’t be rewarded for your patience–instead, your six years of delaying gratification will slash the purchasing power of your wealth by over 10%. The seduction of certificates of deposit is the certainty of the returns. You know what interest payments you will receive, and when. And you have a contract with the bank ensuring payment. But certainty of investment returns can lead to irrational decision-making when it is not weighed against expected inflation. I don’t blame banks for these offerings. They are very clear about the terms being presented to the public. But, in turn, they should be completely disregarded by the investing public. Cash is attractive because of how liquid it is, and you shouldn’t be eager to surrender the ultimate benefit that cash offers for an interest payment that will reduce your purchasing power by 2% per year. My own view is that CDs shouldn’t even be considered for any of your hard-earned capital at all until you are certain it will increase your purchasing power. To me, that means a minimum of 4% interest. But really, you would need to see rates eclipse 6% before I started covering certificates of deposit with any regularity on the site.